Via Rail Artist on Board trip with Kathryn on acoustic guitar and Albert on mandolin. Clickety clack on the tracks from Vancouver to Toronto and back on the Via Rail train. 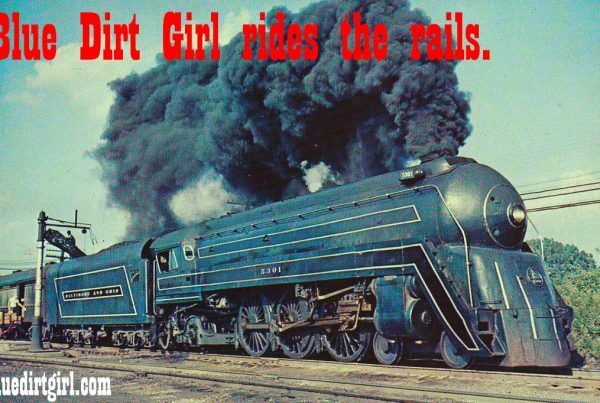 I will be posting daily Blue Dirt Girl Train Diary videos or stories on my .com Blog, Instagram and FB. Watch our Original song BLED AND PAID performed this morning at Vancouver Via Terminal lounge . "... the band goes from the funky shuffle of the opening tune Shed A Tear to the near-perfect AAA pop such as Hey or the closing track Desire with obvious chemistry." Stuart Derdeyn Vancouver Sun Feb. 28. 2017. "During a time when so much music is formulaic and predictable, Crazy Beautiful is refreshingly different. Blue Dirt Girl is not afraid to take risks, and with those risks most often come unexpected and wonderful things!" "Just spent the past hour listening to your songs on YouTube ... all of them accomplished in their composition and performance -- and relevant to what the world feels like today." "blue dirt girl's range of music is like a mixed cassette tape you made for a friend." Paul T. - blue dirt girl House Concert Host. "Sophisticated pop with hints of jazzy swing." "This album sounds like vinyl. It may be a CD but the quality of sound is all vinyl." David Jewer, Recording Engineer, Producer, Mastering Guy at Airborne Recording/Mastering. Kathryn latest musical project is blue dirt girl. 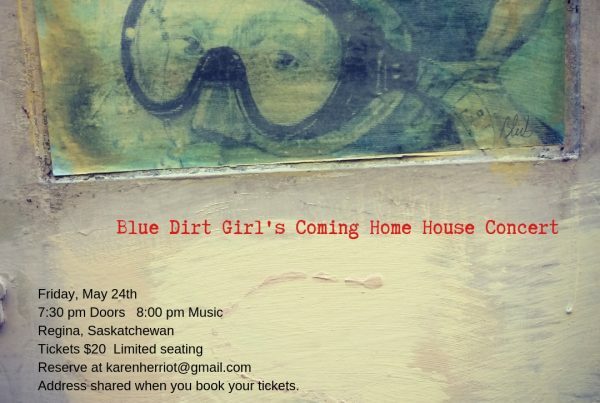 blue dirt girl is Kathryn writing, recording and performing either with trio including Albert Klassen on stand up/electric bass/back up vocals and Jason Overy on drum/percussion, as a soloist, as a duo with Albert and/or inviting guest musicians to join in for various shows. Kathryn, formed her trio in 2015, then recorded blue dirt girl’s debut album,Crazy Beautiful, at Simon Kendall’s Hammond Ave Studio in the spring of 2016. Go to her bluedirtgirl.com blog to get details on the recording process, vintage keys, percussion, pedals and Evan Arntzen horn recording sessions. Kathryn’s blue dirt girl released and toured Crazy Beautiful in August 2016.
blue dirt girl is continually recording and releasing songs with accompanying Youtube videos. Check it all out on blue dirt girl’s Music and Video page on this site. Kathryn produces Chautauqua’s which bring together fiercely talented but often quiet artists to share their music and art in public spaces. An element of giving back to community,either with fundraising or awareness raising, is part of each blue dirt girl event. Kathryn produced a multi disciplinary show, Little Conversations: an evening of music and words, April 2016 at The Cultch in East Vancouver. The audience had an opportunity to listen in on the conversations between three fiercely talented artists. The collaborative event featured the music of blue dirt girl, with Sophie Yendole the poet behind Thinking Ship weaving her words between songs, while Sob Story Podcasts collected conversations with the audience in the Founder’s Lounge. Kathryn produces Magic Kitchen Sessions which are simple Android phone recordings or sound recordings with her 12 mixer from a kitchen or back stoop in East Vancouver. 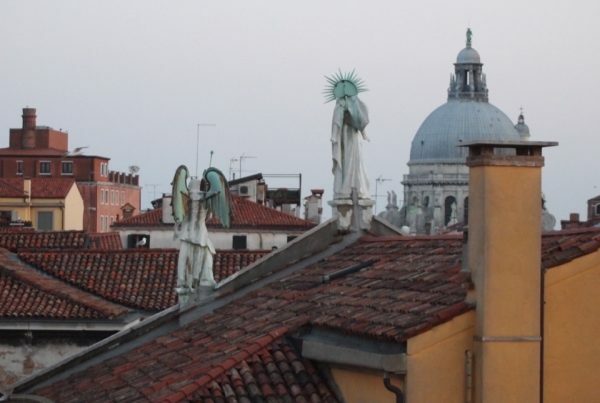 Each Magic Kitchen Session is posted as a video, either with her blue dirt girl trio, duo and/or special guests performing live, on blue dirt girl’s Youtube Channel, blog, Facebook and Instagram feeds. on the blue dirt girl online store. Albert Klassen is a Vancouver bass player, mandolin player and mandolin builder. He’s been playing electric bass with Kathryn in Push3 since 2003, but for blue dirt girl he dusted off the stand-up bass, which hadn’t seen action since he played with Natural Elements, Nyetz, and Balzac in the 1980s. He plays mandolin with Nohearums and Illiteratty, and he will be the first to tell you that carrying a mandolin is easier than carrying a stand-up bass. You won’t find him on Facebook, unless it’s a picture of him on someone else’s page. To sum up Jason Overy as a formally trained percussionist is to give him short shrift. He grew up in Victoria playing with the Greater Victoria Youth Orchestra. He’s played with jazz, blues, rock, punk, and ska bands. He’s been the musical director for Uzume Taiko for over ten years. He’s a percussion section leader for the band of the Fifteenth Field Regiment RCA. He’s collaborated with contemporary dance and theatre groups. He’s even collaborated with DOA frontman, Joey Shithead. 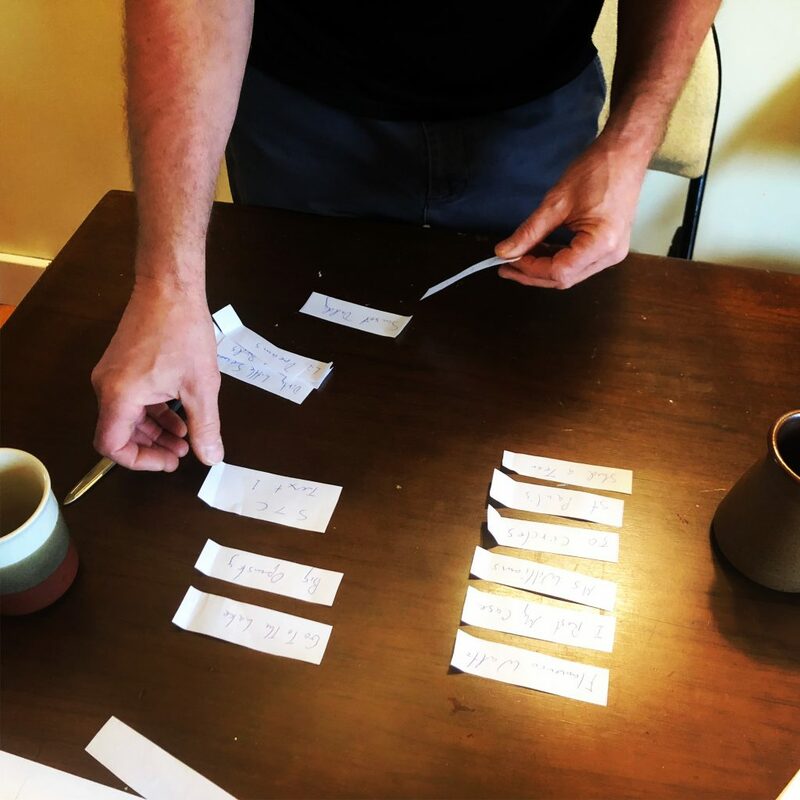 And on top of all of that, he found time to get a third-degree black belt in Shotokan Karate-do and a first-degree black belt in Kokodo Jujutsu. So don’t be giving him short shrift! 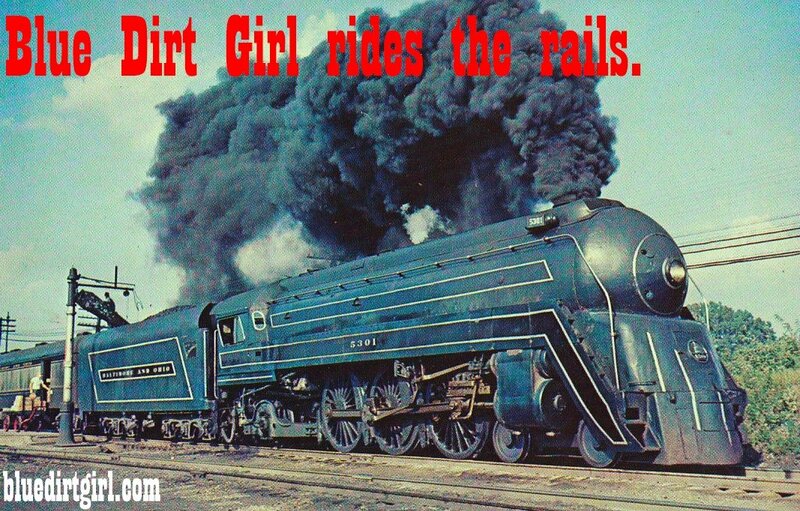 Blue Dirt Girl rides the rails. COMING HOME TOUR- House Concert #1. Let me tell you about my DREAMS.